Gallstone formation is common in obese patients, particularly during rapid weight loss. Whether a concomitant cholecystectomy should be performed during laparoscopic gastric bypass surgery is still contentious. 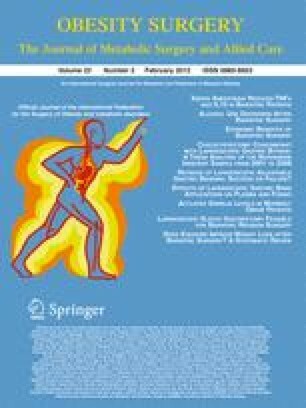 We aimed to analyze trends in concomitant cholecystectomy and laparoscopic gastric bypass surgery (2001–2008), to identify factors associated with concomitant cholecystectomy, and to compare short-term outcomes after laparoscopic gastric bypass with and without concomitant cholecystectomy. We used data from adults undergoing laparoscopic gastric bypass for obesity from the Nationwide Inpatient Sample. The Cochran–Armitage trend test was used to assess changes over time. Unadjusted and risk-adjusted generalized linear models were performed to assess predictors of concomitant cholecystectomy and to assess postoperative short-term outcomes. A total of 70,287 patients were included: mean age was 43.1 years and 81.6% were female. Concomitant cholecystectomy was performed in 6,402 (9.1%) patients. The proportion of patients undergoing concomitant cholecystectomy decreased significantly from 26.3% in 2001 to 3.7% in 2008 (p for trend < 0.001). Patients who underwent concomitant cholecystectomy had higher rates of mortality (unadjusted odds ratios [OR], 2.16; p = 0.012), overall postoperative complications (risk-adjusted OR, 1.59; p = 0.001), and reinterventions (risk-adjusted OR, 3.83; p < 0.001), less frequent routine discharge (risk-adjusted OR, 0.70; p = 0.05), and longer adjusted hospital stay (median difference, 0.4 days; p < 0.001). Concomitant cholecystectomy and laparoscopic gastric bypass surgery have decreased significantly over the last decade. Given the higher rates of postoperative complications, reinterventions, mortality, as well as longer hospital stay, concomitant cholecystectomy should only be considered in patients with symptomatic gallbladder disease. This work has been presented in part at the Annual Congress of the Swiss Society for Surgery (Geneva, Switzerland, May 2011). The authors acknowledge the Team “Research on Research” for the templates for writing the introduction and discussion sections of the manuscript  and the templates for literature review . This work was supported by grant PBBEP3-131567 from the Swiss National Science Foundation (MW). The authors have no other potential conflicts of interest, including specific financial interests and relationships and affiliations relevant to the subject matter or materials discussed in the manuscript. All contributing authors, including Mathias Worni, Ulrich Guller, Anand Shah, Mihir Gandhi, Jatin Shah, Dimple Rajgor, Ricardo Pietrobon, Danny O. Jacobs, and Truls Østbye, declare that they have no conflicts of interest in relation to this manuscript.